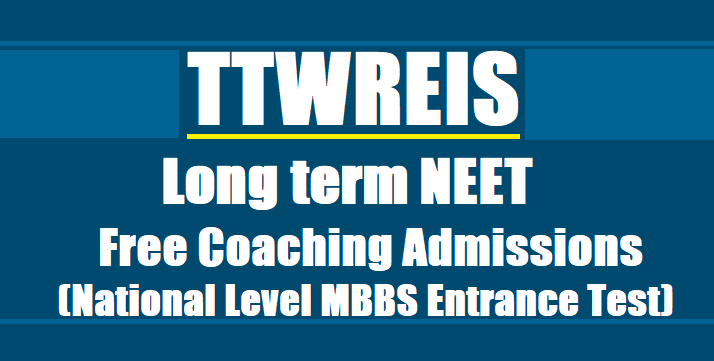 #NEET #freecoaching, TS Gurukulam NEET Free Coaching, TTWREIS/TSTWREIS Long term NEET 2019 Free Coaching Admissions 2018: TTWREIS/TSTWREIS NEET Free Coaching 2018, National Level MBBS Entrance Test 2018 Free Coaching, Long Term Free Coaching Admissions 2018, TS Social Welfare Online Application Form, Long term NEET 2019 Free Coaching Admissions Application Form: Telangana Social Welfare Residential Educational Institutions Society(TTWREIS/TSTWREIS) has published the Long Term Intensive Coaching 2018 notification for National Level MBBS Entrance Test NEET 2019 and applications are invited from Boys and Girls for admissions into Long term coaching for the academic year 2018-2019. Telangana Social Welfare Residential Educational Institutions Society(TTWREIS/TSTWREIS) Hyderabad: Admission into Long term Intensive Coaching for National level MBBS Entrance i.e. NEET 2019 for the academic year 2018-2018. Applications are invited from Boys and Girls for admission into Long term coaching (OPBC) in Medical stream to appear NEET-2018 for the academic year 2018-2019. The following are the instructions to apply for admission. 1. Selected candidates will be informed through SMS regarding their selection on 01.07.2018 as well as placed in the above portal. 2. Classes will commence from 02.07.2018. 1. The students, who belong to ST community should apply (Latest caste certificate issued by the Tahasildar concerned). 2. Only students those who passed IPE in March, 2018 are eligible. 3. The students must have scored 80 marks and above in EAMCET-2018 (conducted by Government of Telangana) (to select under 30% quota). 4. The student must have scored 250 marks and above in NEET-2018 (to select under 70% quota). 5. The Income limit of the parents should be below 2.00 lakhs (Certificates issued by Tahasildar of their native 1st June, 2018). 6. The total number of students intake is 100 only. 7. 50% seats for ST students studied in TTWREIS/ Govt. Jr. Colleges and 50% for Private College. TTWIIT Study Centre, Rajendranagar, Hyderabad in YTC building. 1. The students will be selected on merit basis i.e., The student must have scored 80 Marks and above in EAMCET 2018 (Conducted by Government of Telangana) (to select under 30% quota). The student must have scored 250 Marks and above in NEET 2018 (to select under 70% quota). So, the students will be selected purely on merit of NEET-2018 and TS EAMCET-2018 marks i.e., 70 : 30 (70% students will be taken from NEET-2018 marks and 30% students will be taken from TS EAMCET-2018 marks). 2. Selected candidates will be informed through SMS. 1. The applicant should submit his/her application through on-line our website : www.tgtwgurukulam.telangana.gov.in. 2. On-line application will start from 10-06-2018. 3. Selected candidates will be informed through SMS on 01-07-2018.